So - after a few months of messing around with the idea - and a bit of a pilot episode with language guru Kerstin Cable in the Summer, I’ve finally gotten around to creating a Welsh language podcast. The first episode is with fellow SSIWer @LaraRobs who talks about her art, her Welsh language clothing company, growing up in Swansea amongst other things. The idea of the podcast is pretty simple, I go for a pint(s) with someone and record the resulting conversation. There is no translation sheet, but I think most learners would be able to follow along - and as listening practice this is probably worth its weight in gold as it represents how casual normal Welsh speakers speak down the pub. I’m hoping to do one every couple of weeks with a load of interesting guests, so subscribe now and you’ll download any future ones automatically. Here are the details, you can choose whichever Podcast supplier you prefer… Soundcloud is probably the easiest if you are not a usual podcast listener. “www.soundcloud.com/myndambeintgyda” will be the link for subscribing. 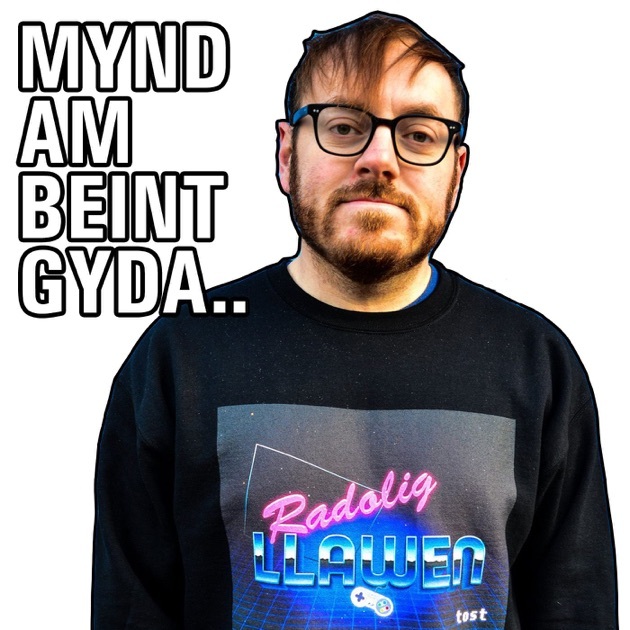 Download past episodes or subscribe to future episodes of Mynd am beint gyda by Mynd am beint gyda for free. I was looking forward to this after seeing you post on your IG! Ten mins in and I’m following quite a bit of it - this is a brilliant resource - thank you! Now I’m curious if I can find you on TuneIn. … No I can’t. Oh, and … is Spotify link a secret yet? The Spotify link is now live! Must’ve gone online since I went to bed last night! Excellent news! Great idea - I really like long conversations to listen to (in English as well as Welsh). I couldn’t find it on Overcast (not sure how you get on there) but I also use Spotify so will try and find you there. Diolch! The plan was to make every sgwrs about 1hr 30ish in length, this one went over a bit because we had a good chat and a few pints! I think the idea is to make it sound and feel like the listener is actually sitting in the pub on the same table - so you’ll hear the clink of glasses in the background, you’ll hear the other punters etc. Must’ve gone online since I went to bed last night! It was live when I’ve searched for the podcast but it says “Explicite” beneath the first track which obviously doesn’t do any significent difference. So, yup, here we are … follow you on Soundcloud, given the spotify playlist to my favourites … all set. It’s been submitted to Tune In. Great! Of all I love TuneIn the most, followed by SoundCloud and then Spotify. Yeah, because of the nature of the chat being largely in pubs, I’m expecting there to be the odd swear here and there. There is some minor bits here and there in this one - nothing that I think would put anyone off - but I thought it would be safer to mark it as “explicit” rather than marking it as “not explicit” then having someone moan to iTunes because a swear got through the airwaves. The use of English words in Welsh is quite natural for a lot of people - and I’m against the demonization that you hear sometimes from people on the subject. If you don’t know a word, give it a think but I’m a big supporter of encouraging people to carry on the conversation. Plus, one of the upcoming chats will be with one of my friends Dilwyn, who is a lifelong first language Welsh speaker, who himself admits his English is not that great - but there are certain parts of his life that he has lived predominantly through English media, such as football etc - so even though you’ll rarely hear him in normal life utter an English word, when we’re down the football he will always shout “Offside” rather than “Camsefyll”, or “Throw in!” rather than “tafliad” or “MAE HWN YN CORNER REFEREE!! !” rather than going with “cornel” or something. I have the same with a couple of mates up here who are mechanics, even though they rarely speak English at all, they learned their trade and skills through English, so will say things like “wheels newydd” instead of the Welsh version, “air filter newydd”, “spark plugs newydd” and things like that. It’s an interesting theory of how it all works! I’ve been perhaps… guilty of only really using iTunes for podcasts because I’ve got an iPhone and thats where I do most of my listening. I do follow a couple of podcasts (especially Welsh ones) via Soundcloud, but until Lara told me last week that Spotify did podcasts also, I really didn’t know they did them! Great idea Nicky. Thanks to you and Lara for letting us listen in to your pub conversation. Looking forward to the next one! I’ve got two more people lined up for the next 2 weeks or so, so hopefully this “once a fortnight” thing may actually be a realistic target! Nice one Nicky and Lara. I downloaded the stitcher app to have a listen and am pleased with the app and the conversation. I’m just over an hour in and can drop in and out of the pub chat as and whenI feel like on on my phone. fortnightly is probably about right for me too. And BBC Cymru itself is the greatest teacher to the newbies in this part. I was surprised to hear such mixture when I’ve listened them for the first time but at the same time it made me understand fairly much more than I would if there wouldn’t be English words now and then (ummm … well, quite often actually). I as a learner and foreign one am bound to search in my mind for the Welsh word or expression in my mind first but as sometimes conversation has to flow quite fast and fluently I( stick English word inthere pssibly the way one fluent Welsh speaker or first language Welsh speaker would stick it in naturally. About Explicite, you’re right. Better hint that there might be some swears or similar heard than not marking the track as so and then having troubles. Yah, I think podcasts on Spotify is quite new thing (if I remember correctly) and a wise one since a lot of people are listening to podcasts these days. The first - besides iTunes - was PoDoMatic I believe and when I was at Knight-Nu forum about which I’ve written quite some in the past here too, We’ve given podcasts of Knight-Nui News on there too. Well, but I had the feeling this service wasn’t as used as before when SoundCloud really came to life and especially now where now there are quite many srevices to put podcasts on or to create radio stations with your own content. Mixcloud is one of them too. It’s a weird one indeed. I’m currently doing a degree in French through the medium of French - and I find myself that if I make a mistake, or if I forget a French word - my first instinct is to use a Welsh word! Which leads to loads of weird looks from my fellow Frenchies. … so get yourselves ready SSIWers! Unless you come to Slovenia there’s no fear for me to be anywhere near.